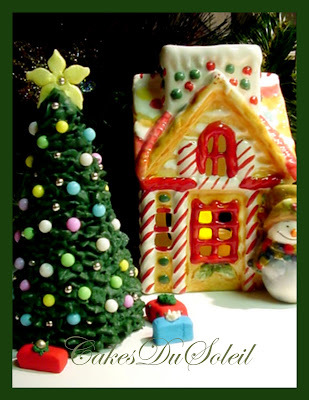 Roll out white gumpaste to ¼” thickness. Cut into a 6” by 1” rectangle. Using a ¾” rectanglar gumpaste cutter, cut out evenly to make rungs in the ladder. Set aside to dry completely. If completely dried, the gumpaste should be strong enough to hold one elf. If you haven't enough time for the ladder to completely cure, then cover two bamboo skewers with fondant and gumglue over the two sides, then add a scalloped trim to the outside of the ladder. Rectangle. Cut through the center bottom and diagonally as shown in diagram. Gently roll out cut edges to create arms and legs. Using black gumpaste, make belt around waist. Create mittens by rolling small ovals, using scissors to snip thumb. With ball tool, hollow the end of sleeve slightly and gumglue mittens to end of arms. Roll two small sausages. Bend to make bottom of boot, the use ball tool to hollow pant cuff and attach the boots to the legs with gumglue. Cut a round belt buckle using #10 tip. Attach to belt and place dragee over buckle. Using ¾” circle cutter, cut a fur collar. Texture fur using toothpick and place over top of body at neckline. Arrange arms and legs into desired positions. Push a toothpick vertically through body and set on Styrofoam to dry. Roll a small marble size ball of flesh colored gumpaste. Using the small ball tool, push in 3 holes for nose and eyes. Make a tiny ball for nose and attach with gumglue. Cut two blue eyes using #5 tip. Flatten with ball tool. Cut two black eye pupils using #4 tip. Flatten and attach to blue. Place the two eyes into sockets. Dip toothpick into white color. Touch to add glint in eyes. Make indention for mouth and color with pink edible marker. Cut a round White circle, using large end of tip. Texture to create fur trim; round with ball tool and attach to top of head. Make a cone using red marble sized gumpaste and attach over white fur. Make a tiny white ball for the tip of hat. Roll out light brown and cut with ¾” circle cutters overlapping to create letter “C”. Texture using toothpick. Moisten slightly with gumglue, attaching to face to create beard. Make two teardrop shaped flesh colored ears and attach to head, pressing with small ball tool. Place head on body using gumglue. 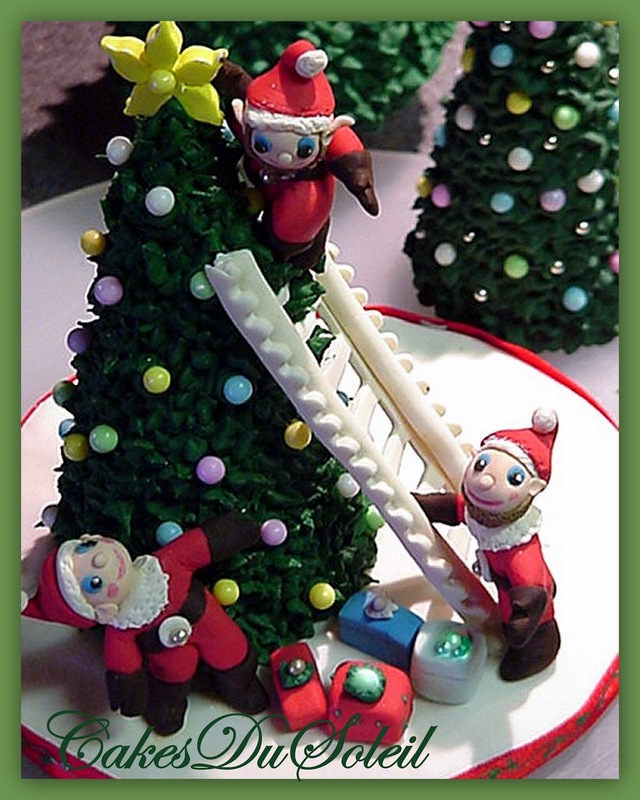 Place ladder diagonally next to tree, and attach elves to tree and board as if decorating the tree. These little guys are fun and easy to make and would be a great project for you to do with your kids!